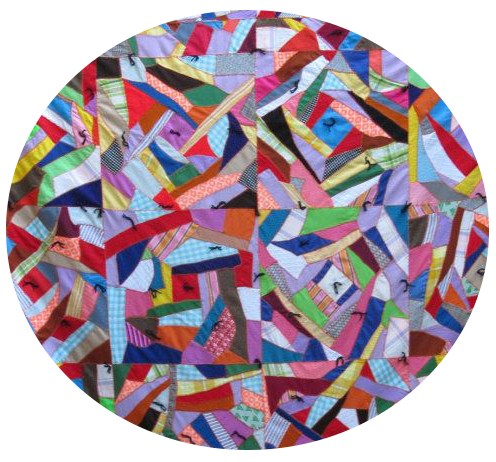 Scrap quilts are quilts that are made out of the leftovers from other quilts or everyday sewing. 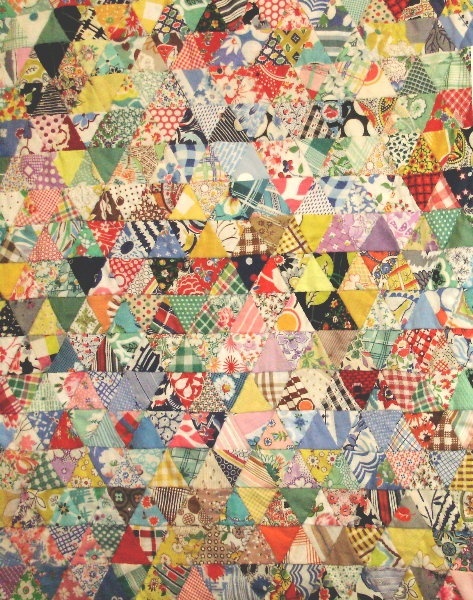 Women often had little pieces of material left over from fixing clothing or bedding and would store them away in a safe place until there was enough to make a patchwork quilt. Sometimes scrap quilts have themes such as ‘blue fabrics’, ‘flowers’ or ‘baby fabrics’, however making a quilt just from forming little squares together in blocks and then sewing them all together to make a quilt top can have an amazing result. 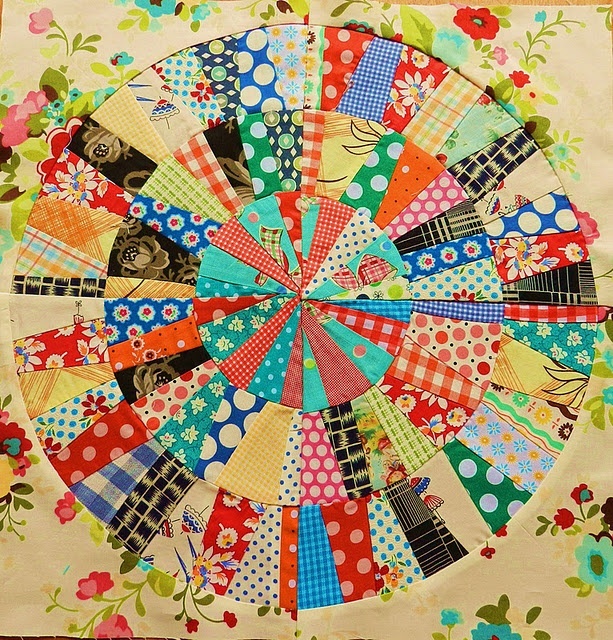 There is even an old tradition surrounding scrap quilts (kind of like a urban legend!). Apparently if you make a quilt out of 1000 pieces of fabric, with no two being the same then the quilt is “charmed” and any dreams to be had while sleeping under the quilt will come true. Scrap quilts can also be a great way to make a memory quilt for your whole family. 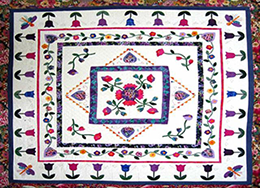 Traditionally memory quilts are made of the clothing or materials used by a loved one who has passed away, however many people are now making memory quilts or family quilts out of bits of the childrens, husbands, sisters, brother, parents clothing and coordinating them all so they have a family quilt. The material can come from old material including; shirts, dresses, pants, handkerchiefs, scarves and even coats. It is not only a fantastic way of keeping your memories of what everyone’s favourite clothes were at a particular time in your families life, but will also cost you nothing as you have already got all the material. To make a memory or scrap quilt, simply put aside your kids favourite clothes as they grow out of them (because they do this so quickly when then are young!) and over a period of time instead of throwing out shirts with holes or pants that have a mark on them, pop them in the cupboard. When you think you have enough, wash everything and if there are any stains, marks, holes or worn away parts it is best to cut them out immediately so you don’t accidentally use those bits. Then cut the clothes up making sure you cut as close to the seams as possible so not to waste any of the good material. Depending on how you want your quilt to look it might be an idea to sort the materials into colors so you can see how much of each that you actually have. And you are ready to start. If you think you might not have enough material then you can always choose a color and go and buy a yard or two of plain cotton that would tie the blocks together very nicely. For example, this is a great idea if you have mainly blue clothes and want to lighten the color, then you can introduce a white/cream or even a pale blue. Alternatively if you have a mix of brightly colored clothes then perhaps strips of white or black would set them nicely. Refer to the choosing color section for advice on what colors mix well. 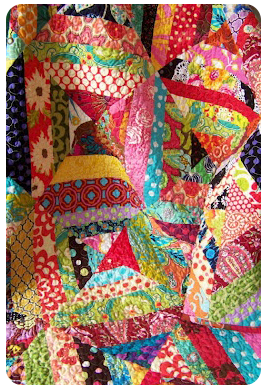 Check out our section on scrap quilt patterns for help on making your own scrap quilts.